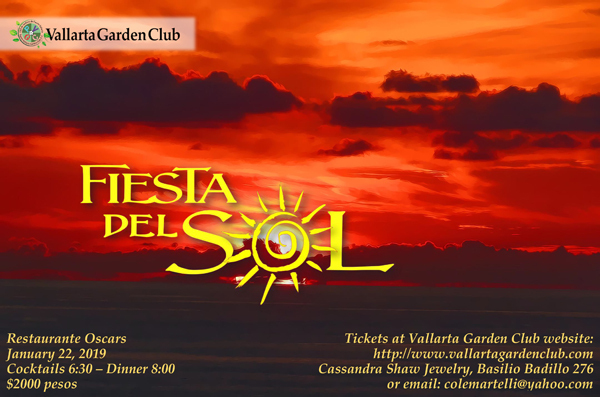 We hope you'll join us for our season gala of "Fiesta del Sol" at the beautiful Oscar's Restaurant on the Isla Cuale, where the river meets the sea. Save the date of Tuesday, January 22, 2019 where the festivities begin with Cocktails at 6:30 pm and Dinner at 8:00. Donation tickets are 2000 pesos and can be purchased with PayPal at Vallarta Garden Club , stop by Cassandra Shaw Jewelry on Basilio Badillo or email Cole Martelli, PVGC Treasurer, to pay by credit card at colemartelli@yahoo.com. This event always sells out quickly so get your tickets today. The Puerto Vallarta Garden Club A.C. is a registered, non-profit, public benefit, Mexican Corporation supported by private financial contributions.